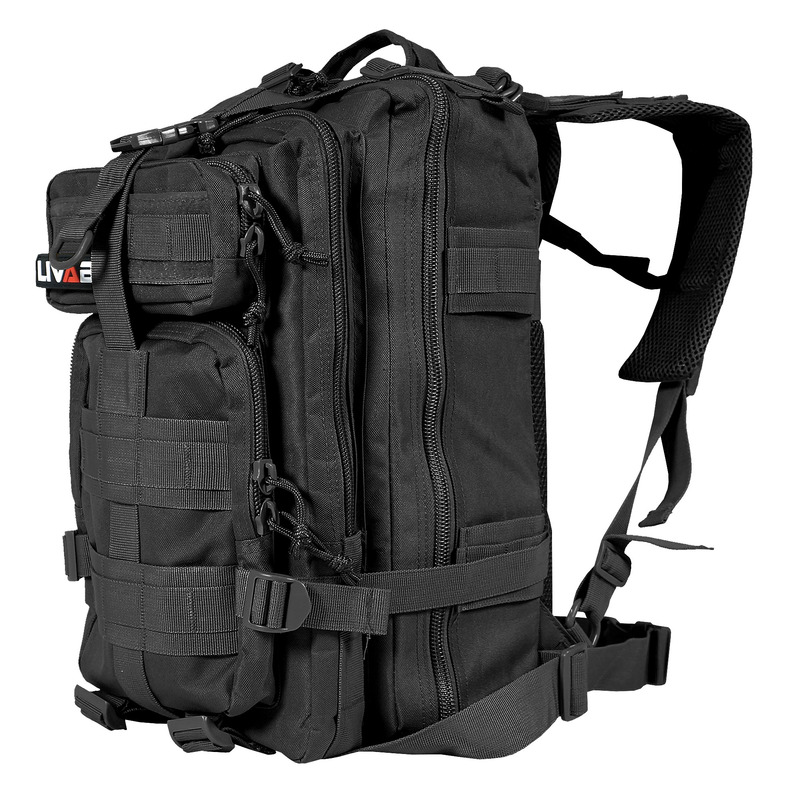 LIVABIT Tactical Backpack has a rugged construction and modular application is the foundation of our design to help you conquer routine, the unexpected, and everything in between. Combining the most rigorous military features with mountaineering ergonomics, this tactical backpack can be used as a 3 day assault pack, bug out bag backpack, combat backpack, range bag, hunting backpack, survival backpack, outdoor hiking, adventures, rucksack military army backpack or trekking backpack, or for your everyday use. Versatile Anchor points on the exterior and interior of the pack enables you to continually adapt and evolve the pack configuration to your changing needs. A lightweight attachment system along the handle provides an easy way to attach bulky items such as a rope or jacket to the top of your pack for easy access. Comfortable Aerated closed cell foam padding aids in superior shock protection and comfort. Built in mesh straps and back panel designed to provide proper ventilation while resting against you. Wider straps were designed to spread the load on your shoulders evenly distributing the weight of the load. Engineered to handle heavier loads more comfortably. Livabit tactical backpack is an ergonomically designed backpack built to be your trusted companion for adventures both close to home or missions far away. Modular Laced with Pouch Attachment webbing and is compatible with Modular Lightweight Load-Carrying Equipment (MOLLE) pouches so that you can customize the layout of your gear to suit your needs. • 2 Primary Compartments: Store essentials for camping, hunting, hiking, and combat training. • 2 Secondary Compartments: Pen, tool, wallet, accessories holder. • 1 back slot: Water Bladder compartment (bladder not included). • Water resistant inner lining: Shields stored items from moisture exposure. • Waist and Sternum Strap: Relieves pressure off shoulders and aids in distributing weight evenly. • Compression and Decompression Adjustment: Expand or minimize the size of bag easily. • Single hand carrying strap: Grab and go handle for side profile carrying.